Volunteers are the best..! – Healing Arenas, Inc.
We’re so grateful here at Healing Arenas for any and all volunteers who breeze in and out of helping us. An exceptional one has been helping for many years, and deserves all the accolades due her! 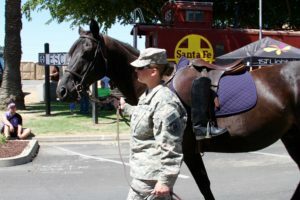 Please join us in thanking Fallon Nunes for all her help – with the horses, the veterans and especially her heart. Cheers, Fallon – and to many more!